Kody and Diane at Scottsdale putting the moves on the cows. Back in 1981 Diane invested in the Khemosabi Syndicate with the hopes of breeding her own champion. She even kept a keychain with a photo of a National and Scottsdale ribbons in it to remind her how much fun it would be to win one of her own. Kody with just some of his trophies. "Never did I imagine that I would someday have a room full of ribbons thanks to Kody, his sister DD Kherisma, his daughter Hi Socks, and a gelding Red Hot Roni from the Khemosabi daughter Cinnamonn Bay. Khemosabi had a lifelong influence on my life and I will always be grateful to him and his dear owners Ruth and Paul Husband." 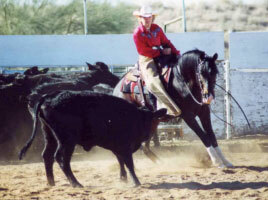 Kody and Jimmy Reno at Scottsdale. Kody wasn't just an amazing cutting horse—he is an accomplished sire, whose foals have great personalities and are incredibly athletic. As Diane note, "All of his foals who have had a chance to enter a competition in a show ring, endurance race or cow pen have been winners. 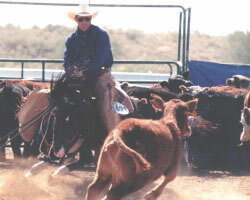 He has produced winners in cutting, working cow, dressage, endurance, team penning, drill team, and halter. 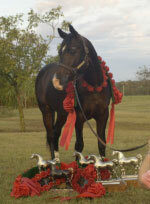 Many of his foals are family horses loved by their owners and their children." While many people might think that's enough for any one horse to accomplish, Diane would disagree. "But most important, he has been my companion and horse friend all his life. He is gentle and kind, loves to play in the river, and a joy to be with. He is one of those once in a lifetime horses we all hope to have, my childhood dream fulfilled beyond my greatest hopes. As a youngster I loved the black stallion books and always dreamed of owning an Arabian. Kody is my 'Black Stallion' and dream come true." Kody and Diane explore the river. What advice would she give to those who would like their own dream horse like Kody? "I really don't know how to say this, but I would like to encourage others to pursue their dreams. I never had much money for training or shows, it was always a challenge to keep Kody and me getting to shows, and some years we had to stay home and miss the big shows or miss finishing the year higher in the standings. It was hard to find a trainer who would work with us and that I could afford. But as I look back now, it was so worth the effort." Diane welcomes you to call her if you have any questions about her boy, or would like more information on capturing your own dream.